A dingy-looking plant with a rosette of oval, ribbed leaves and a number of upright flowering spikes. The flowers are small and greenish without obvious petals and are at their most attractive when the anthers are produced. Because the plant relies on the wind to carry its pollen to other plants, these are carried at the ends of long slender filaments so that they catch the slightest breeze. 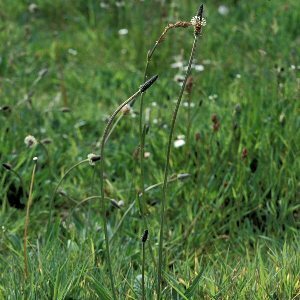 This species is very common in open habitats such as arable fields, roadsides, pathways, shingle banks and many other such situations. 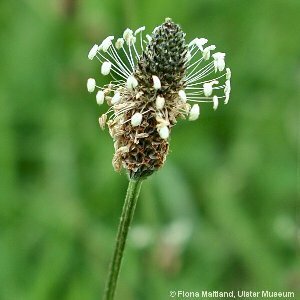 All names: Plantago lanceolata L.; Plantago timbali Jord.